June marks the first official day of summer, and we kicked off the summer season with plenty of awesome free bead jewelry patterns! Even though it's summer and we're all busy enjoying the warm weather and sunshine, we still found time for making beaded jewelry this month. Whether you took our free bead jewelry patterns on the road with you for your summer vacation, or whether you were making beaded jewelry inside on those scorching 100-degree days to beat the heat, you clearly kept busy beading all month long! Which free jewelry making projects caught your attention in June? Well it's no surprise that this month's #1 most popular project was a beaded macrame bracelet since macrame bracelet patterns are always huge for the summer season! Yet that was the only macrame pattern that topped the charts this month. 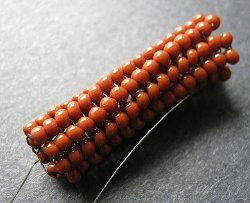 The free bead jewelry patterns that most tickled your fancy in June were primarily free seed bead patterns and projects! No surprise there either, since free seed bead patterns are popular all year long. There are also some free wire jewelry tutorials thrown in the mix for all you wirework fans, so there are definitely free jewelry making projects to suit anyone and everyone in this collection. Check out your all our reader favorites below, and get ready to sit poolside this summer with some free bead jewelry patterns! 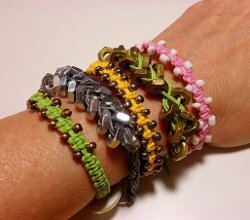 Arm Candy Square Knot Beaded Macrame Bracelets - These simple beaded macrame bracelet patterns are the most sizzling summer trend. Make a bunch in bold colors and stack them to get the full effect. 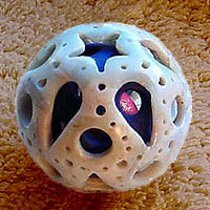 Bead in Bead Project - This amazing project is actually three beads in one! This is one jewelry tutorial you don't want to miss. You've never seen anything like it! Tila Bead Openwork Right Angle Weave - Mixing Tilas in with free seed bead patterns always has a stunning effect. The parralel Tila beads running along this pattern create a cool striped effect. Evening Sparkle Bracelet - Sparkly jewelry is always in season. This gorgeous right angle weave pattern is perfect for summer evening parties and special occasions. Cascading Autumn Arbor Necklace - Even though June kicks off the summer season, our readers were already ready for fall projects this month! It's no surprise though with this beautiful necklace. This is truly a seed bead masterpiece not to be missed. 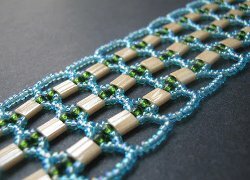 Twisted Tubular Herringbone Tutorial - We featured a lot of spectacular free seed bead patterns and projects this month, and this herringbone tutorial was one of them. This is a technique you can use to create necklace chains, bracelets, or tube beads. Dreamcatcher Heart Pendant - For the wirework lovers out there, we have this pretty wire heart pendant. This tutorial teaches you how to create a cool webbed design using wire and crimp beads. Perfect for Fall Necklace - Another fall-themed project made its way into our top 10 this month, but it's no surpise considering this freeform peyote stitch pattern is always a fan favorite. You can change the color palette of this design to work for any season. Freeform Peyote Beaded Geode Pendant - This freeform peyote stitch pattern is a great way to feature a lovely geode as a pendant. It creates a softer, prettier effect than the usual wire-wrapping technique. Easy Wire Bead - If you're looking for new ways to use wire in your jewelry designs, try these easy wire beads. You can whip up a bunch in no time at all.